Yesterday, we ate like kings. 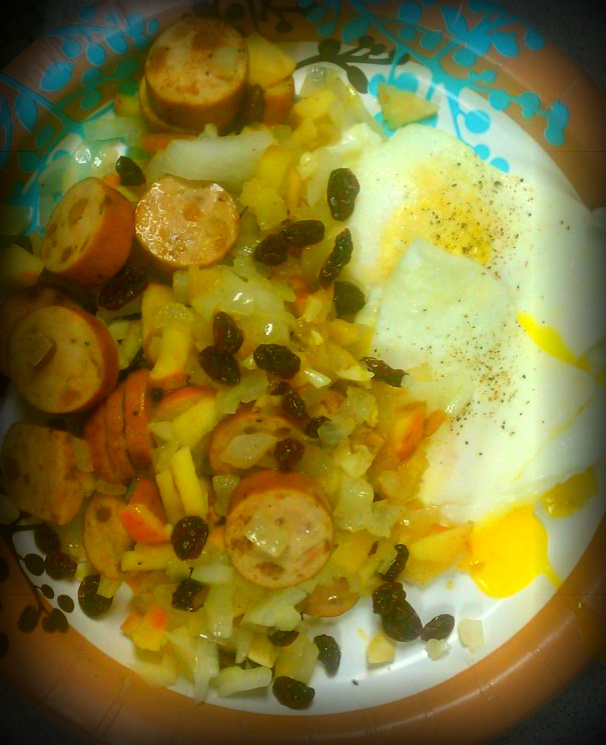 Day 4 Breakfast: Sunny-side-up eggs, chicken apple sausage (Applegate Farms), sauteed onion & apple with Cinnamon and raisins, and good ol’ coconut bark for fat! We definitely need to make a grocery store run today as our fridge is, once again, empty. 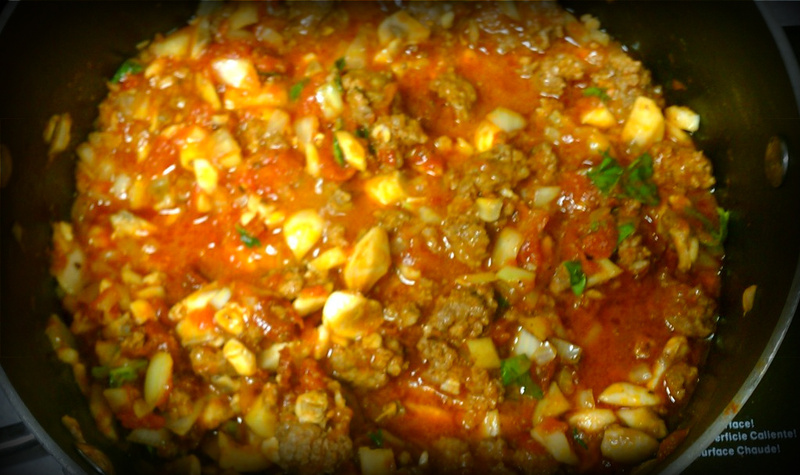 Lunch: I made the best meat sauce ever! I sauteed an entire sweet onion, a clove of elephant garlic, and mushrooms in a bit of coconut oil. I found a preservative/additive free marinara sauce that had all “real-food” ingredients. As the veggies were sauteing, I browned a lb. of grass-fed organic ground beef in a separate pain, seasoning it with only a tiny bit of kosher salt and copious amounts of ground pepper. Once the veggies were nice and soft, I added the browned meet and the jar of marinara sauce. I then added some fresh thyme, parsley, and basil to the mix. I let it cook for a little bit and served it over some spaghetti squash. Dinner: I made chicken seasoned with curry, roasted coriander, and ground ginger. 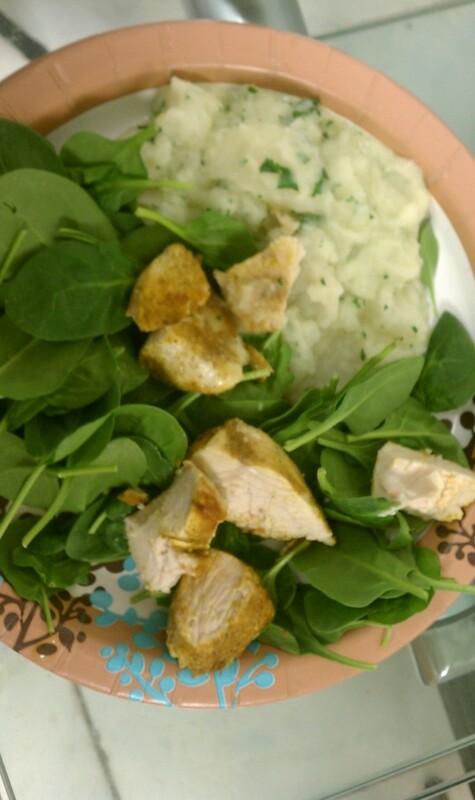 I served it with turnips mashed with ghee, roasted garlic, and fresh parsley. I had a bunch of peaches in the fridge and decided to try and make some peach cobbler. 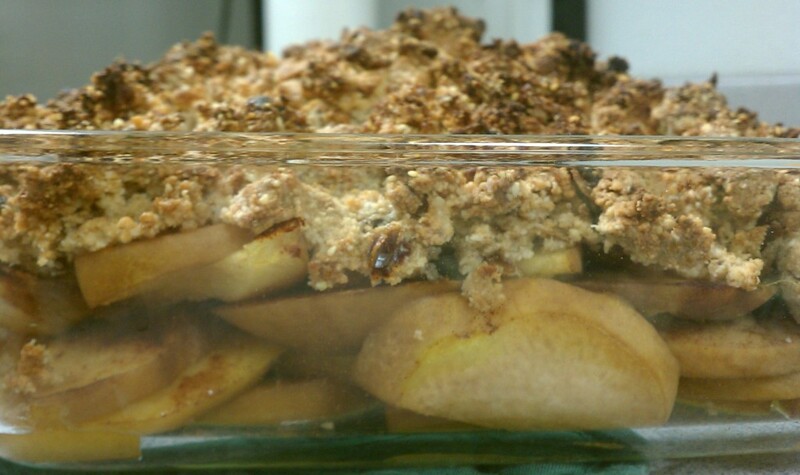 For the crumble I used almond flour, Medjool dates, Cinnamon and coconut oil. It didn’t really come out as good as I would have liked. The peaches were too dry. I think next time, I’ll put a little organic apple juice in the pan to cook the peaches down better. Chad really liked it. I thought it was just okay.